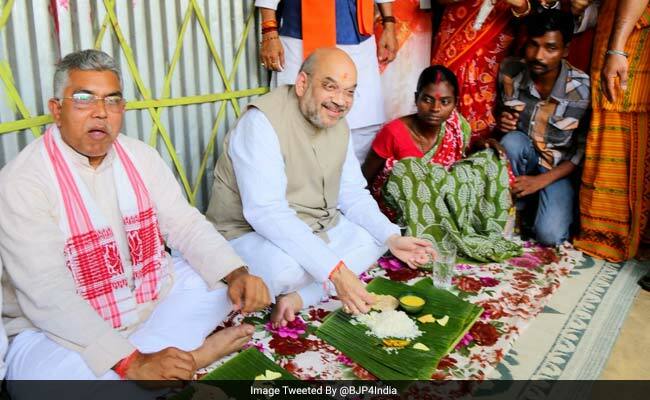 BJP chief Amit Shah sat cross-legged on the floor in a small hut with a tin roof in a north Bengal village in Naxalbari and ate a traditional Bengali meal served on banana leaf. He was hosted for lunch by Geeta Mahali and her husband Raju, a house painter. Since then, Ms Mahali, who works as farm labour, has become something of a selfie star, with excited villagers posing with her. "Such a big man has come to my house," exclaimed Ms Mahali after lunch. Asked if she would give Bengal chief minister Mamata Banerjee lunch, she paused and then said, "Yes." No maachher jhol or Bengal's famous fish curry for Mr Shah. To the BJP chief Geeta Mahali served a simple vegetarian meal of rice, daal, potol or pointed gourd and a squash curry, with salad and papad. At the modest home in Dakkhin Katiajote village, Mr Shah received jamai ador, special treatment reserved for a son-in-law. When asked about it by this reporter, Mr Shah smiled. Ms Mahali, in a red and green sari, sat to Amit Shah's left as he ate. To his right sat the BJP's Bengal chief Dilip Ghosh. As he launched the BJP's Mission Bengal, Mr Shah has set an internal target for Mr Ghosh and his team - uproot Mamata Banerjee's Trinamool Congress by 2019, when Prime Minister Narendra Modi will seek a second term in the national election. The BJP had won two of West Bengal's 42 Parliament seats in the 2014 national election, the Trinamool had won 34. "The Trinamool Congress may think they can stop Modiji's chariot, but they cannot stop it. The more they try to stop us, the more the lotus will bloom here," Mr Shah he said at a meeting of BJP workers after lunch, adding, "In 2019 (Lok Sabha polls), the BJP will get the maximum number of seats in West Bengal. The people of the country will witness it." Mr Shah's strategy, as in other states, is to establish the BJP at the grassroots in West Bengal, where it has had little presence, and the BJP chief launched a booth-level campaign today in Naxalbari, where the violent Naxal movement of the 1960s had begun. His three-day tour of West Bengal will also see him visit Mamata Banerjee's Bhabanipur constituency. West Bengal is the first of five states that Mr Shah is visiting in the next 15 days; he has picked the states that his party is the weakest in. He will visit Odisha next and then Telangana, Tamil Nadu and Kerala and tour each for three days.